Latest Government job Notification for Forest Guard posts under Forest department of Bihar State. Forest department of Bihar Government published a official PDF notification in Hindi language on to the following official website: “http://www.csbc.bih.nic.in”. So we drive all the information from that PDF file and share with you readers in English language after translating that PDF file from Hindi to English. We share that official PDF file link under IMPORTANT LINK section at the last of this article. 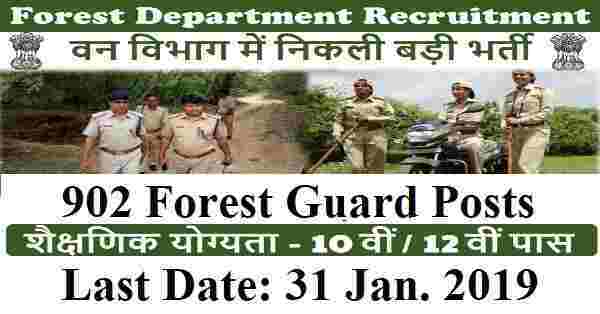 Forest department is looking to recruit fresher Indian candidates for 902 Forest Guard posts in various station all over Bihar state. So those who are waiting for the Government job opportunity in Bihar state can apply for this Forest department recruitment 2019. The process for applying these Forest Guard jobs is online through the official website of the forest department. More detailed information related to this Forest Department recruitment 2019 is given below in this article. Read the whole article carefully before going through the online application form. Number of Vacancies: 902 Posts. Pay Band: Rs.5,200 – Rs.20,200 +GP Rs.2000 per Month. Educational Standards: All Indian fresher candidates who have passed in their 12th class examination under any stream can apply for this Forest Department recruitment 2019. Age Bond: Applicants age must have in between 18 years to 23 years. Those who lies in between this age criteria can apply for these Forest Guard jobs. Check the table below to know more about the various physical requirements and various physical tests which candidates have to clear to grab these Government jobs as a forest Guard. Paying Method: You can pay the above examination fee structure through one of the following channel: “ Credit Cards/Debit Cards/Net Banking” (OR) E-Challan. 1ST Jan. 2019 is the Start Date to Apply. 31st Jan. 2019 is the Last Date to apply.